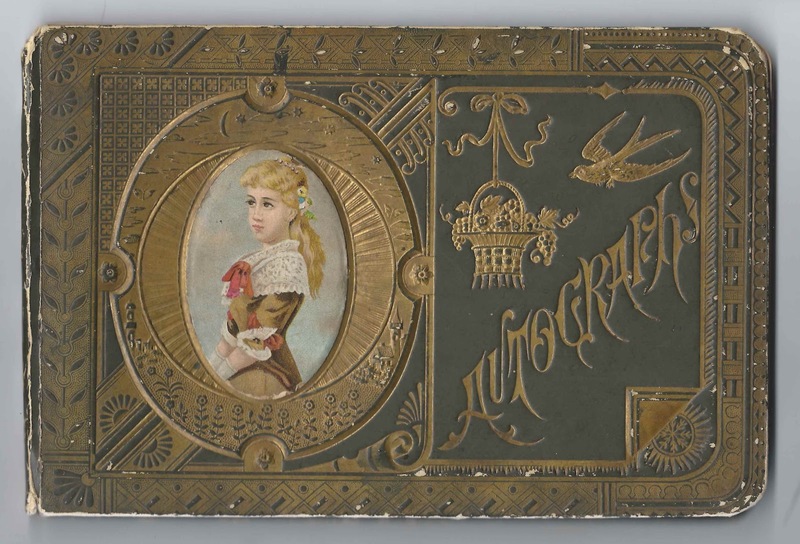 1889-1890 autograph album that I believe belonged to Clara Elizabeth Coburn of Groton, Massachusetts, or "Clarissa", as she was also known. Though her Massachusetts birth record shows the name Clara, most other records give her name as Clarissa, and that's the name she used when she signed a page in her album on September 12, 1890, at about the age of eight. Another signer dedicated her page to "Clarissa". The album is approximately 9" x 6" and contains the sentiments of 23 of Clarissa's relatives, friends and schoolmates. An alphabetical list of the signers appears at the end of this post. According to her Massachusetts birth record, Clarissa was born Clara Elizabeth Coburn on 22 August 1882 at Groton, Massachusetts, the daughter of Moses Burbank Coburn and Emma Harriet (Whiting) Coburn. Emma's mother was Clarissa (Childs) Whiting, and the name Clara may have gradually morphed into Clarissa in honor of her grandmother. Both Moses Burbank Coburn and Emma Harriet (Whiting) Coburn signed pages in Clarissa's album. 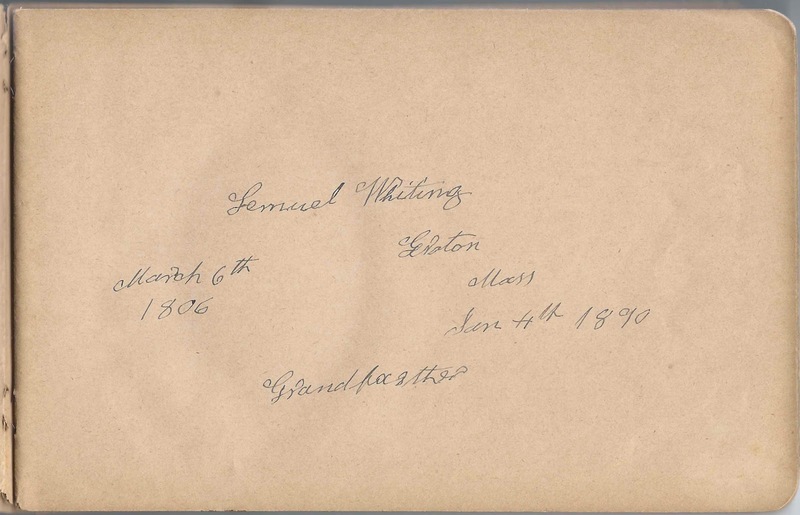 Clarissa's maternal grandfather, Lemuel Whiting of Groton, Massachusetts, signed a page on January 4, 1890. He gave his birth date: March 6, 1806. 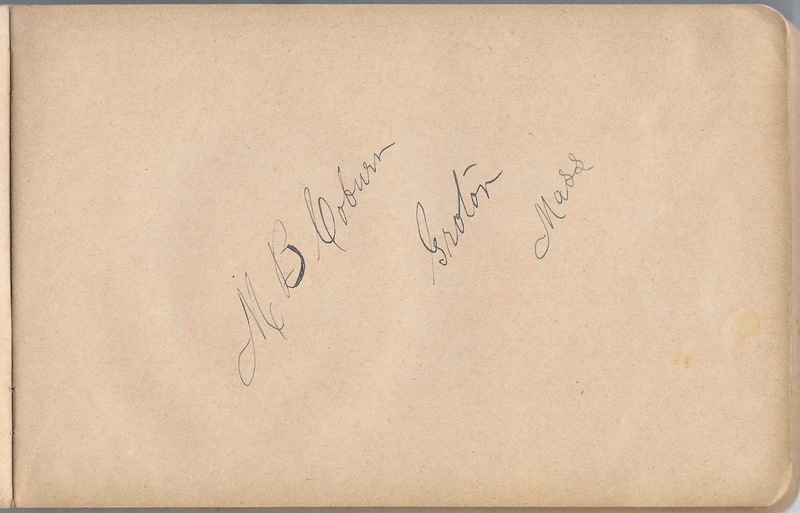 Clarissa's brother Fred William Coburn of Groton, Massachusetts, signed a page. On 7 July 1908 at Groton, Massachusetts, Fred would marry Flora Belle Blood, daughter of Charles and Malvina (Gilson) Blood. I don't believe Clarissa ever married. She lived with her parents until their deaths. The 1930 Census found her living alone at Groton, Massachusetts, and working as a bookkeeper at a grocery store. She also worked at the Groton library. She died in Groton, Massachusetts, in 1972. 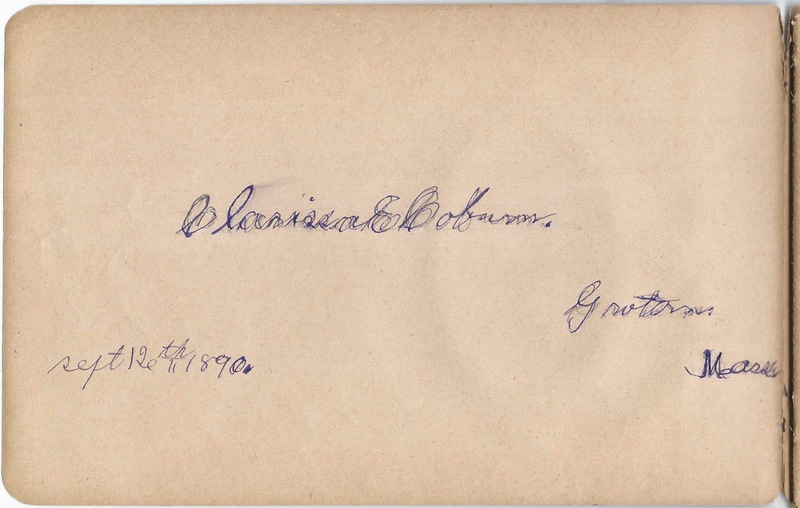 Rosa B. Bates of Hubbardston, Massachusetts, signed on "1890-8-4"
Clarissa E. Coburn of Groton, Massachusetts, signed on September 12, 1890. Presumably album owner Clarissa E. Coburn herself. 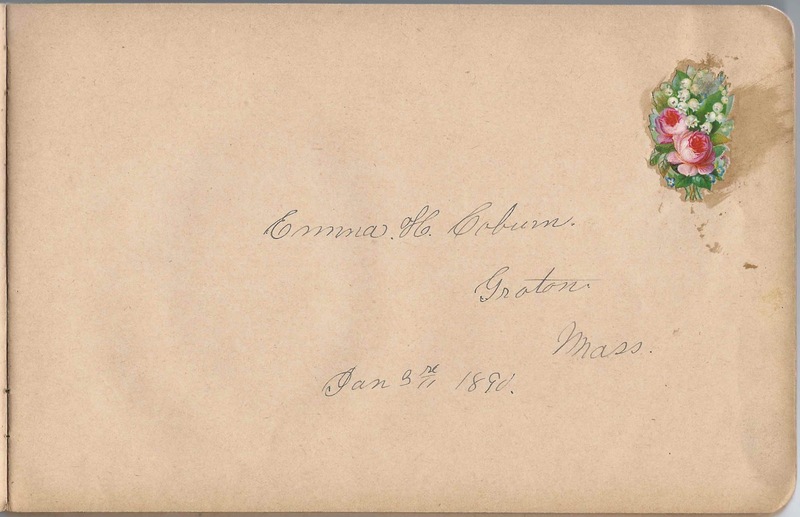 Emma H. Coburn of Groton, Massachusetts, signed on January 3, 1890. Presumably Clarissa's mother, Emma Harriet (Whiting) Coburn. Fred W. Coburn of Groton, Massachusetts. Clarissa's older brother Fred William Coburn. 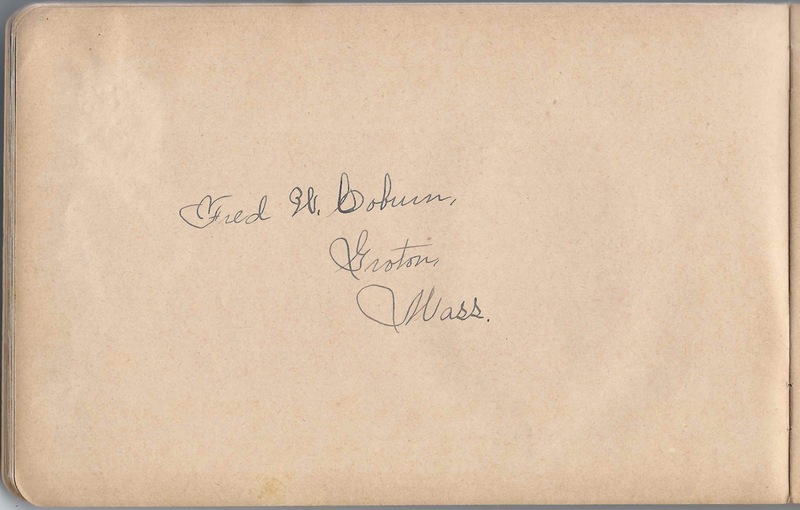 M. B. Coburn of Groton, Massachusetts. Moses Burbank Coburn, Clarissa's father. Cynthia L. Harrington of Groton, Massachusetts, signed on January 16, 1890. Middle initial might be S.
Henry W. Whiting of Groton, Massachusetts, signed on January 3, 1890. He was Henry William Whiting, older brother of Clarissa's mother Emma Harriet (Whiting) Coburn and husband of Sarah Jane (Patch) Whiting, who also signed a page in the album. Sarah J. Whiting of Groton, Massachusetts, signed on January 3, 1890. She was Sarah Jane (Patch) Whiting, wife of Henry William Whiting, who was the older brother of Clarissa's mother Emma Harriet (Whiting) Coburn. Sarah's husband Henry William Whiting also signed a page in the album. Lemuel Whiting of Groton, Massachusetts, signed on January 4, 1890. He gave his birth date as March 6th 1806. He was Clarissa's maternal grandfather.